Rory McIlroy says a new cockiness and belief in himself is helping him break records at the US Open.
" I'm feeling good, feeling very good you know, it's funny to me, you know, it feels quite simple. I'm hitting fairways. I'm hitting greens. I'm holing my fair share of putts. And that's really been the key. There's no -- and I've missed a couple of greens that I was able to get it up and down. But apart from that, it's just been -- I've just really stuck to my game plan and stuck to what I wanted to do, very committed to my targets, that's basically it. I don't really know what to say. It's been two very, very good days of golf. I put myself in a great position going into the weekend. But I know more than probably anyone else what can happen. So I've got to stay really focused and try and finish this thing off. I said a couple of things that I've done is just a little change to my attitude and my demeanor, maybe, on the course. I did a piece after Augusta where I said I needed to be a little more cocky, a little more arrogant on the golf course, and think a little bit more about myself, which I've tried to incorporate a little bit, just on the golf course. I just try and have a bit of an attitude, you know? But that's really been -- when I get myself in these positions, I have to really make sure that I'm -- that I don't get ahead of myself and I don't start playing defensively. I have to still play aggressively to the targets that I pick. And that's really the main thing, even if you get 4 or 5 ahead of the field, 6 ahead of the field or whatever, you're trying to get 7 ahead, 8 ahead, ten ahead, whatever, you're just trying to keep going. He said the victory by fellow Northern Ireland player Graeme McDowell last year in the same event inspired him. "I don't know if it gives me added confidence. It definitely gives me added incentive. It would be nice to -- it would be nice to follow in his footsteps. I was very happy for him last year. I was at home in Northern Ireland watching it because I didn't make the cut at Pebble. It's nice to have a chance going into the weekend to win the trophy that he won last year. 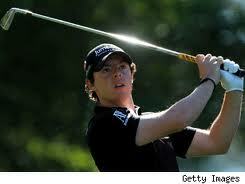 As fo rhsi record breaking performance, McIlroy stated it mad eno difference unless he won the tournament. "These records, they're nice, but they don't really mean anything until the end of the tournament. If I can look back on this tournament with a trophy in my hand and look back at the records, that would be nice."